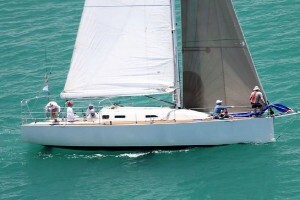 This Jon Sayer designed Sayer 13 was built in 2000, under her previous ownership she won the Osaka race. This Sayer 13 is powered by a Beta Marine Kubota 40hp engine with a Flexifold 3-blade folding propeller. She is equipped with a Kubota 7kw generator, a 2.5kw inverter, air conditioning and heating throughout the boat. This Sayer 13 features a full carbon mast and boom, steel shrouds, roller furler and a bowsprit. She also has an impressive sail inventory. This Sayer 13 features cork decking across the whole boat. The cockpit is protected by a full bimini and closing spray bimini for bad weather. She also has a Sunbrella cover. This Sayer 13 was refitted in 2010 to turn her from pure race boat to a comfortable cruiser/racer. She has been fully insulated for heat and noise. Accommodation for six is provided within two double cabins and a convertible saloon. There are two double cabins located forward and aft, each with a double berth and hanging lockers. The saloon area converts to make another large double berth. There is a spacious bathroom located to port, aft of the forward cabin. The bathroom features an electric toilet, shower and sink with hot water and electric water pump. The compact galley is located to aft starboard, and features a fridge, freezer, microwave, induction stove, alcohol stove and oven, toaster and twin sinks. This Sayer 13 is also equipped with a 2.5m aluminium dinghy and a 8hp Yamaha outboard engine.